If you are someone who enjoys the outdoors you likely are well acquainted with the importance of having the right gear. This is especially true when adding into the harsh winter conditions seen when ice fishing. Many fishermen are testing the limits of this sport and carrying it on all year long. In fact, some fisherman even travel to colder destinations, such as Alaska and Minnesota, for the sole purpose of ice fishing. 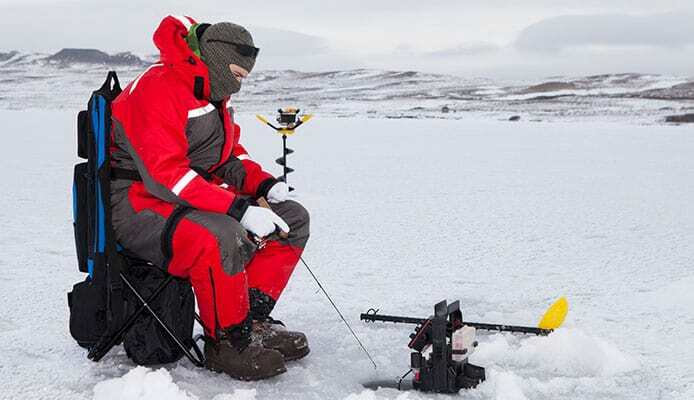 Anyone who has ever tried ice fishing will tell you that with the prolonged exposure to the elements, there is a great importance that needs to be placed on gear. 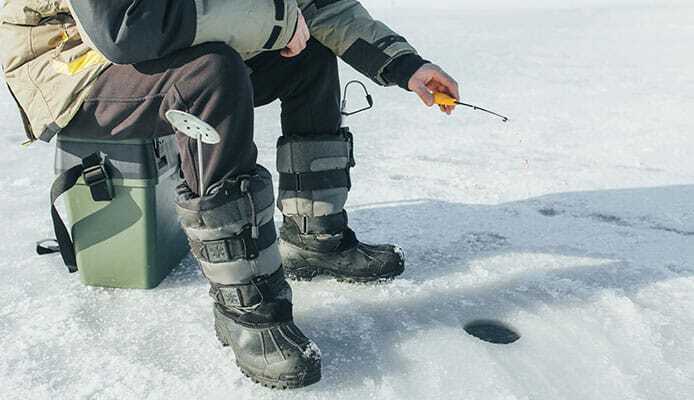 Perhaps most importantly, it is crucial to have the best winter boots for ice fishing. As you lose a great amount of heat from your feet, having the best footwear will go a long way in keeping you warm and safe. When you are in these cold winter conditions, having appropriate gear can mean the difference between life and death, or at least serious injury. These types of conditions are prone to frostbite and hypothermia. When you are still for extended periods of time, as done with fishing, and in cold conditions, your body will naturally pull all heat to protect your core. This leaves your extremities, such as your feet and fingers, at a great risk for frostbite. 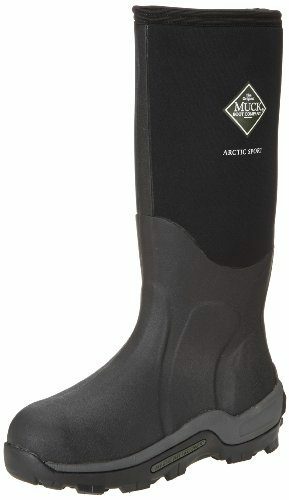 Having the best ice fishing boots can make a great difference to your safety and comfort. When you are in such vulnerable conditions it is important to have the best gear. To help keep you safe and help navigate you through all the different options available to you, we have put together a list of what we consider to be the top options available on today’s market. We have also gone into great detail about what features are important to look for in your next pair of boots. Ready to get started? Let’s go. These are not your typical cold weather rubber boots. They may look standard but once you look a little closer you’ll find extra features only found on high end options. 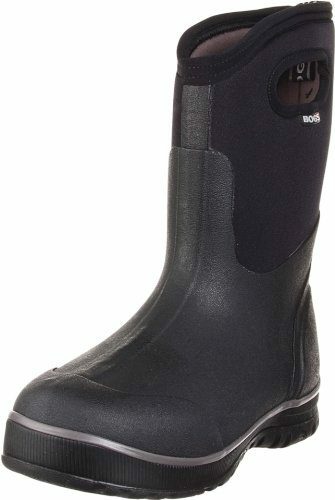 A 5mm neoprene material extends halfway up the length of the boot allowing you to get through over ankle deep water. This is a flexible yet durable material that is completely waterproof. The upper half is a leather and synthetic material that works to keep your legs warm. In fact, these boots are rated to -20 °F (-30 °C). The inside has a fleece lining and a faux fur trim. This combination makes your feet happy while still looking stylish. Sizing of this boot is a breeze with sizes ranging from 5 to 15 and fit as you’d expect. There’s no fancy lacing system either. Simply pull these boots on and you’re ready for extreme conditions. No longer will you be sliding around on the ice. The tread on these boots has a multi directional pattern so you’ll always have your feet planted firmly on the ground. It even has added ankle support so your ankle stays more rigid leading to better stability. Sorel uses a combination of leather, synthetic textile, and Thinsulate Ultra insulation. The leather is on the upper part of the boot while the synthetic material will encompass your foot. 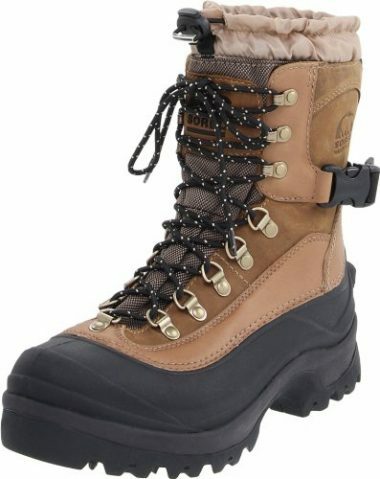 This combination makes this a top rated winter boots for ice fishing. You’ll love how durable they are as well. The leather is designed to be waterproof and the seams have been sealed for the best waterproofing. Also, the EVA foot bed is also removable so you can dry them in record time. There is also a lacing system that has 6 loops and 3 hooks so you can get the perfect tightness. Sizes range from 7 to 14 with some half sizes to ensure you get the best fit possible. There are also 3 colors to choose from including “British Tan”, “Bark”, and “Boulder”. If the path to your fishing spot is particularly muddy or slushy Rugged Shark has you covered. These boots have a rubber material running the entire height of the boot. This makes them guaranteed to be waterproof. Rugged Shark has also made flexibility and comfort a large priority with these boots. Long ago are the days of rubber boots not being flexible and breathable. The sizing of these boots range from 8 to 13 and fit true to their number. They are also almost entirely white, so be careful where you put these down as they tend to be camouflaged in the snow. Tread on these boots leaves a little to be desired. They don’t have the best grip so just keep this in mind if you need to climb to your fishing hole. 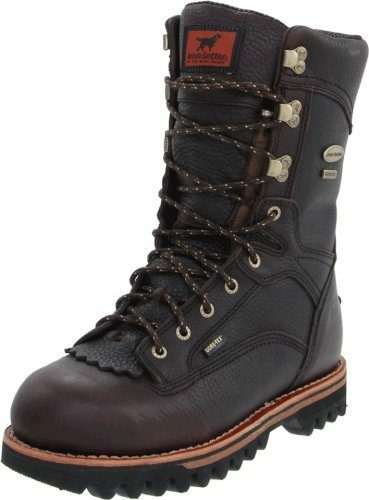 Irish Setter has made some of the best men’s winter boots for ice fishing. Not only do they include features and technology only found in elite boots but also fit comfortably right out of the box. If you’re tired of your boots smelling bad you’ll be pleasantly surprised by these. Irish Setter have included their ScentBan throughout this boot to kill the bacteria that create odor. These boots also use a combination of Gore-Tex and 3M Thinsulate to keep your feet warm and dry. The Gore-Tex doesn’t allow moisture to enter while getting your sweat to pass right through. The Thinsulate is the leading insulation that keeps your feet warm. The sole of these boots has a bull eye styling that uses multi directional lugs to ensure you stay upright. Sizes range from 9 to 15 with loads of half sizes. There are no pressure points or places that can cause friction against your skin. This is due to the extensive lacing that sinches these tightly against your foot. 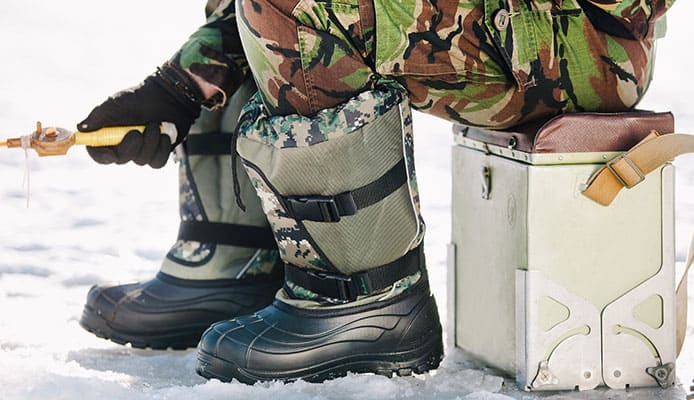 These specially designed ice fishing boots are 100% waterproof due to their triple-dipped latex neoprene. This makes them ozone, acid and even chemical resistant. The material has also been designed to be more flexible than rubber found on other boots. 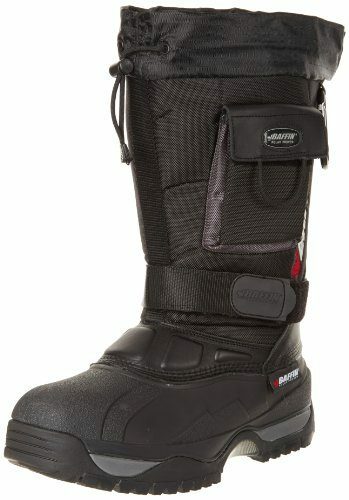 The base of the boots are good for groomed conditions but shouldn’t be used for long hikes. A moisture wicking breath-o-prene insole makes walking even more comfortable. You’ll feel like you’re on a cloud even if you’re on your feet long term. If you somehow manage to get the inside wet the insoles also have open cell technology which makes them quick drying. A toe and heel bumper has been added so the boots are more durable and comfortable against unforeseen rocks. Also, if you’re in an ice fishing house you can fold down the boots which reveal the camouflage printed liner. Ideal For: Mud, Deep SnowThese boots feature a rubber shell making them great for muddy and wet conditions. They are 100% waterproof and feature only a few seams of the material. This means you’ll be able to trudge through deep mud without worrying about it seeping into the inside of your boot.When most people hear rubber boots they think of poor ventilation - but not these boots. Bogs have designed the insides for maximum wicking that keeps your feet dry. The Inside bootie features a 4 way stretch design overtop of a contoured EVA footbed. This is also used in combination with Bogs DuraFresh bio-technology to kill odors. If you find you have smaller feet this may be the best pair of winter fishing boots for you as the sizing goes as low as 4. That’s not to say these are solely for people with smaller feet - the sizes range from 4 to 15. 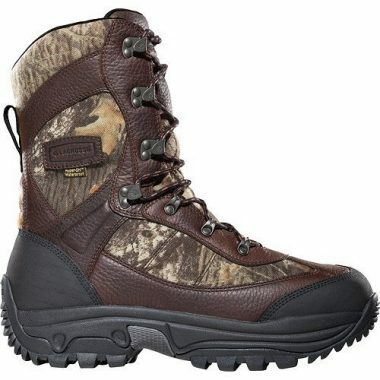 If you have to hike to get to your ideal ice fishing spot these are the boots you should be considering. They are lightweight and have technology built in to make them great for longer treks. 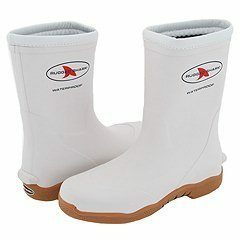 These boots extend lower than other ice fishing boots (10” inches high) but offer great dry and waterproofing technology. In fact, these boots have 2 000 grams of Thinsulate Ultra insulation which keeps your feet warm even when you’re not moving around. You’ll also find them lighter (44 ounces) which also increases your endurance. Not having to lug around heavy boots will increase your range. They also have a nylon shank that significantly increases the support and rigidity of these boots. The reinforced heel and toe cap have abrasion resistance built in so you don’t have to worry about wearing them down. The Hunt Pac Extreme even have built in rubber crampon style grip in the toe and heel. This will allow you to grip ice and snow even when you’re in a vulnerable position. If you love ice fishing but don’t like super snug boots Kamik has your back. These will keep your foot snug while not being cinched against your leg. Keep in mind that these fit larger than you may expect. This allows you to have a little extra room and not feel cramped. The lower portion of these boots is a rigid rubber material which works to secure your foot in place. Higher up features a 1000 Denier waterproof nylon that encompases your calf. The lacing system only has 3 loops but does a good job at ensuring your foot stays in place. There is also a cord system that lets you close the top of the cuff ensuring no snow can enter. Inside the boot, you’ll find an 8mm Zylex liner that can be removed. This is great if you have orthotics or want to clean the soles. The tread of these boots is a stud style which gives you excellent grip. Baffin is one of the top boot companies on the market. They’re from Canada so you know their products have been properly tested and designed for the extreme conditions. 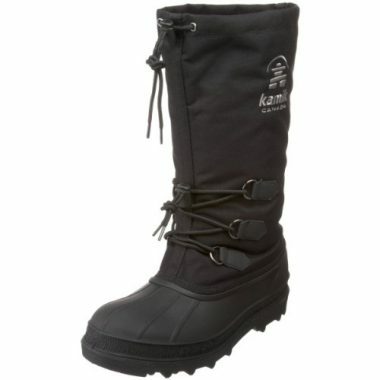 They are known for exceptional build and design of their ice fishing boots. The Endurance Snow Boot uses a combination of fabric and rubber to keep your feet dry and warm. 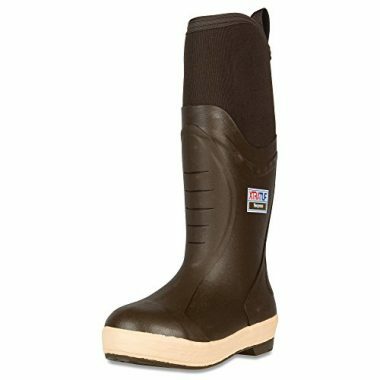 These boots extend nearly 15 inches tall so they will help keep the lower part of your legs protected from the elements. You can walk through nearly knee deep snow without worrying about it getting in your boot. You can even use the synch line at the cuff of the boot to secure it tightly against your body. The entire boot is waterproof. It even features taped seams used in the construction of dry bags to ensure you don’t experience any moisture against your skin. Sizes range from 7 to 14 so no matter how big your feet are you will be protected by these boots. You’ll even be able to use layers of socks to further insulate your feet - not that you need to since these have been designed for arctic conditions. This company is named appropriately. 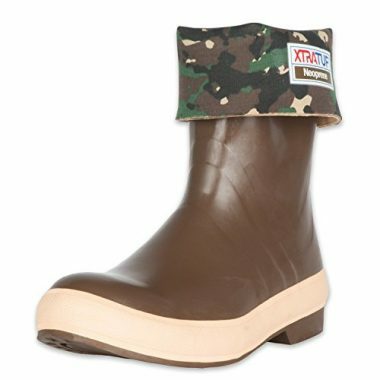 Xtratuf has revolutionized the rubber boot. The Elite Series uses a neoprene material that while is waterproof also has an RDR oil that withstands many organic and inorganic acids, oils and chemicals. This neoprene bootie rises well above the ankle allowing you to not have to look where you’re stepping. Above this is a Spandura high abrasion nylon that has been rated to -20 °F (-29 °C). The base of these shoes has a non-marking Chevron patterned sole. This doesn’t give the best grip on ice but is excellent to trudge through deep snow. The cool thing about these boots is that they have reinforced rubber layers that not only increase durability but also adds layers between your feet and the terrain. As with buying any sort of outdoor gear, it is important to buy the best options available to you. This is not simply for style but rather for comfort and safety. As you will be spending a great deal of time with prolonged exposure to rugged winter conditions, it is important to have the best gear to keep you protected. When looking for your next pair of ice fishing boots it is important to look at a few key features first and foremost. These include a great level of insulation, traction, and durability. A lot of what determines whether the boots you opt for will be durable depends on the materials used to make it as well as the design itself of the shoe. While it may be difficult to navigate your way through the many options available on the market, it can be quite a bit easier if you know what you are looking for. That is why we have put together this buying guide. Here we will explain the terminology used in these boots as well as the features that are available to you. From here you can know all of your options and be better suited to get the best pair for you. One of the most important aspects to consider when looking for winter boots for ice fishing is the insulation. The insulation in your boot will help to keep your feet comfortable and warm for long days. These types of boots all come with different levels of insulation. The level of insulation your boot has will tell you the climate it is ideal for. Warm fishing boots can be a lifesaver – literally. In very cold extreme conditions you will need a boot with a higher gram of insulation than in more mild conditions. The insulation will also provide added comfort to your boot with extra cushioning. Keeping your feet properly insulated will allow you better mobility by increasing your circulation. This will work to keep the rest of your body much warmer as well. You will come across many different materials that feature insulating properties such as rubber, wool felt, zylex and more. As frostbite is a major risk with this kind of activity, it is important to focus on adequate insulation in your boots. We typically recommend sticking with a 400 gram insulation rating for harsh winter conditions. This will work to provide enough cushion and insulation to handle rugged winter cold of below freezing temperatures. For milder conditions, a rating of 200 grams will be more ideal for use in more moderate fall and spring conditions. It is important to ensure that you have a boot that hits at the mid calf level for the most thorough insulation. When ice fishing you can count on the terrain to be wet and slippery. The icy and heavy packed snow conditions make you prone to slipping. This can be incredibly dangerous, especially when walking over a frozen body of water. While it may cause injury, in some conditions it could even cause you to fall through the ice, a potentially life threatening mistake. For this very reason, having a shoe with appropriate traction should be one of the first things you look for in your next ice fishing boot. Traction from your shoe comes in many forms and depend mostly on the conditions you will be walking in. In snowy conditions, a deep tread should be enough to keep your feet secure. In ice conditions, you will want the sole of your shoe to feature spikes that allow you to hold your position firmly. Modern designs for this type of boot should have rugged grip that will keep you in place with ease no matter how slippery the ground under your feet is. While your regular winter boots may be weatherproof or water resistant, this is simply not enough for ice fishing. 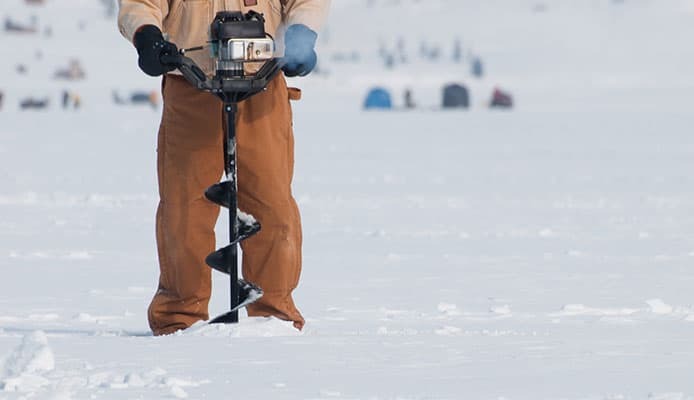 As you drill your hole, you will likely find yourself in a pool of frozen ice water all around you that can make your feet incredibly uncomfortable. If your boots are waterproof your feet will stay safe, warm, and dry. If they are not properly sealed you will find yourself uncomfortable and cold very quickly forcing you to cut your day short. This rugged layer is most often made of a tough rubber material that works to perfectly seal your shoes. While the bottoms of your shoes will need to have a tough waterproofing layer, the upper area of your boots may be merely water resistant. This is done to reduce the weight of these boots. Typically you will find this area of your boot being made with a leather, nylon or rubber material. At the top of your boot, you may notice a gaiter. This area of the boot provides better insulation but can be a very important part of the waterproofing ability of your shoe. When considering how much your shoes will hold up to the pressures of the outdoors be sure to pay specific attention to the fastening mechanisms. Laces can act as a weak point in your shoe and let in a lot of moisture. Instead, opting for a shoe that features zippers or buckles will provide stronger protection. Ice fishing boots need to have a balance between size and weight. If the boots are too bulky they will be clumsy and get in the way of your walking. Also, if they’re too heavy you won’t be able to walk for long distances before getting tired. But a light boot may not have the insulation or high quality materials needed for extreme conditions. While traction is incredibly important as it helps you to keep moving forward without issue, grip is also important. Grip refers to your ability to stay planted in one position with slipping around. This is specifically important when fishing and standing in the same position. When fighting to reel in your fish you need to be assured that your feet will stay planted below you. This will go a long way in preventing injuries and is especially useful in reducing the risk of pulling your back when slipping. This is one safety feature that can not be ignored. If not for your safety, having adequate grip will make it so that you have to exude far less energy just to stay upright. When fighting to reel in your fish you need to have everything on your side possible, including shoes with the best grip possible. Snow boots with removable liners are a great option for this type of use. The liner refers to the interior part of the boot that comes into contact with the sole of your foot. Being able to remove this after a long day out on the water will go a long way to increase the lifespan of your boot. Here you will be able to remove, clean, and appropriately dry the inside of your boot. This will decrease moisture within your boot and work to keep the odor of your boot fresh. Ice fishing boots, like most boots, require a significant investment. While it is one purchase that is incredibly worth it, you want to ensure that you can get the most out of your money. For this reason, you need a pair of boots that are rugged enough to stand the test of time. A lot of times, this comes down to the materials that are being used. Choosing a high quality boot is a choice that you will not regret. It may be wise to choose a big name brand as they will often have top of the line qualities. We recommend looking into boots that come with some sort of warranty. This will go a long way in ensuring that you get the most from your money. This is how you can tell the quality of the boots. If the company uses lower quality materials you’ll know the boots won’t stand up to the conditions or last over time. Ice fishing can be during some of the most adverse conditions and your boots need to be able to protect you. This is partly personal preference and necessity. If you prefer softer material you can go for waterproof leather and a high Denier nylon or if you prefer rubber you can choose a thick neoprene exterior. This doesn’t refer to how the boots look. Design includes the combination of materials and build quality. Added features like toe and heel caps add to the design and make the best boots. A distinction between the boot and cuff should be made as well. This means tough and durable material should be used around your foot while softer material should surround your calf. The sole should also have enough traction to get you through any conditions. We suggest getting over engineered boots. This way you’ll be confident and capable in any conditions. The interior should feature technology that wicks away moisture while insulating your foot from the ground and extreme weather conditions. It’s quite difficult to walk comfortably if your boots are too rigid. But at the same time, your boots should have enough stability to brace your ankles from hidden rocks and ice. The key is to find a balance between these two. We tend to lean more towards the flexible side as this is ideal when you have to be mobile. It doesn’t matter if you have the best insulation on the market if it’s not protected by a waterproof material. Once your feet get wet you’re in trouble. This is especially important if you have to walk any extended distance to your favorite spot. The outer cover should extend over the top of your foot and ideally past your ankle. This will ensure your feet stay dry even if you step in the occasion puddle. Q: Why Do I Need Special Ice Fishing Boots? A: You may be wondering why you need boots specifically designed for ice fishing. While many newbies may try to get away with wearing normal winter boots, this could lead to fatal results. As with all other fishing, you can expect to be spending long hours in the outdoors. As you will be ice fishing, you can expect to be exposed to some rather harsh weather conditions. 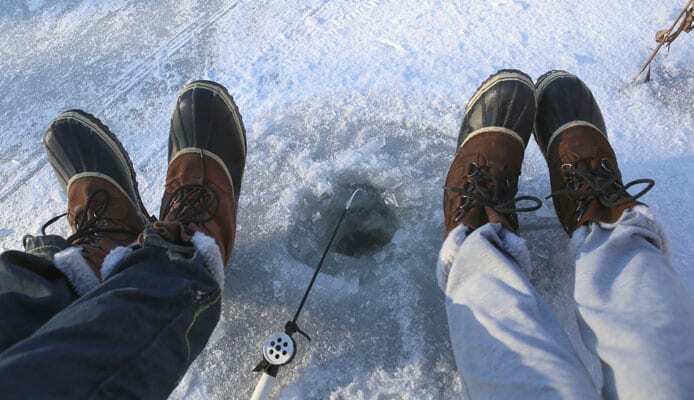 There are two main reasons you will want to opt for boots specifically designed for ice fishing. The first is to combat the harsh weather conditions and provide you with extreme protection from the elements. These ice fishing shoes shouldn’t just be weatherproof, they should be waterproof. They should also be well insulated to keep you warm for long periods of time. They should also be equipped with a pretty rugged sole that will allow you to get all the traction needed in wet, icy and snowy conditions. The second reason for opting for this style of boot is comfort. As mentioned, you can expect to be wearing these shoes for a good amount of time. For this reason, you will want to ensure your feet sit comfortably. This goes with the importance of your shoe being waterproof. Having cold or wet feet will not only mean an early end to your day on the water, it could also be quite dangerous. Q: What Is the Most Important Feature Of Ice Fishing Boots? A: This is a hard question to answer. Some people say build quality while others say weight. We think it’s the weather rating. If you’re in -20 °F (-29 °C) weather you need to be able to trust that your boots can handle the conditions. At that temperature, it can actually become dangerous for you to be outside. Your boots could be the only thing protecting your feet from frostbite. Q: What Material Is Best For Ice Fishing Boots? A: This isn’t an easy question to answer as for the most part, it comes down to personal preference. It is important to ensure your boots are fully insulated and have a temperature grade rating that is suitable for the environment you will be fishing in. You will also want to make sure that no matter the material you end up choosing, it is pre-treated. You will find this in synthetic materials or leather. Especially when opting for leather shoes, it is wise to try the boots on before purchasing and move around in them. These styles can be quite restricting and limit how comfortable you are on your fishing trip. Q: What Level Of Insulation Is Better For My Boots? A: This depends on the temperature of the area you are fishing in. For winter months that experience the freezing temperatures suitable for ice fishing, we recommend opting for a heavy grade of insulation. For these conditions, 400 grams should work well for you. It isn’t unless you are experiencing warm spring or fall conditions that you will want a lighter 200 gram insulation rating. Q: Does The Grade Of Insulation Alter The Weight Of My Boots? A: As you may have predicted, a heavier grade of insulation will lead to an overall heavier boot. While this may seem like a downfall, it is worth foregoing an ultra lightweight shoe in order to get proper insulation. While we would normally say to find a happy medium between the two, in this case, you will want to focus your attention in proper insulation first. Q: Do I Need Special Socks? A: While any socks will do the job of protecting your feet and providing a layer between your feet and your boot, you will likely want to opt for a proper winter sock. A sock intended for winter, such as wool socks, will work to compliment your boots and give you the best performance. Winter socks are thicker which will add an extra layer of cushion, and comfort, to the sole of your foot. They also tend to be a bit higher sitting mid calf. This will allow you full protection from your shoe avoiding any potential rubbing of your boot that may cause blisters. It is worth noting that winter socks tend to be much thicker than your average sock. This can change the fit of your boots. For this reason, we recommend having your socks beforehand and trying on boots with your socks before choosing the best size and style for you. Q: Do I Need Crampons? A: Whether or not you will need to add crampons to your boots will depend on the type of boot you have, or rather the sole of your boot. Some ice fishing boots will come equipped with a hefty amount of traction that eliminate the need for crampons. Secondly, it will also depend on how rugged of terrain you will be going on. If you find yourself treading on slippery icy conditions, crampons will likely be a very good option for you. Q: Are Regular Laces Good For My Boots? A: Strictly speaking regular laces will work fine with your boots. Upgrading should be based purely on personal preference. 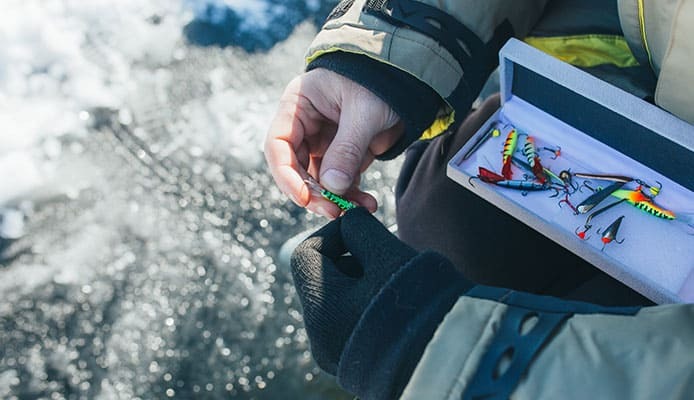 Laces that are specifically designed for ice fishing will have a thicker and longer design that will be much easier to use, especially with thick gloves on. They also tend to have a longer lifespan than other types of boots. With that being said, if you would rather keep to your regular laces, these should work just fine as well. Q: Can I Use Snow Shoes With My Boots? A: Using snowshoes with your thick ice fishing boots will likely be fine to do. It will depend solely on the size of your snowshoes. As ice fishing boots will be a bit bigger, so long as your snowshoes will be able to fasten around your boots, there is no reason to not wear the two together. Be sure to consider the flexibility of the fastenings on your snowshoes. You don’t want to stretch too far to account for your bigger boots and risk doing harm to your snowshoes. Q: Do My Boots Need To Be Tight Fitting Or Loose Fitting? A: As with most other shoes you will buy, it is important to find a happy medium between boots that are too tight and too loose. Boots that are too tight can be incredibly uncomfortable and even dangerous causing circulation issues. They can also restrict the air movement in your boot which will cause your feet to be colder and risk getting wet. When too tight you can also risk your boots rubbing on your feet and causing blisters to form adding to your discomfort. You also will want to stick away from boots that are too loose for you. Shoes that are too big for you will not be as waterproof and weatherproof as they are designed to be. The gap in size can cause water and wind to enter your boot and lead to you being less protected. The bigger size will also feel less stable on your foot putting you at an increased risk of injury. When deciding on the best size boot for you, it is important to try the boots on before making the purchase. This will help to identify whether the boots are a good fit. If you have to decide between the two, we recommend opting for a boot slightly more loose fitting as your socks will add an additional layer to your foot which will likely make up for the gap in spacing. Opting for the best boots for you, it is important to pay special attention to ice fishing boots reviews such as this one. We have designed this page to equip you with all the knowledge necessary to go out and make the best purchase for you. Now that you know what to look for and the correct terminology you should have everything you need to buy the best boots for your next ice fishing trip. All of the boots on our list feature the best materials and functionalities to provide thorough protection for you. Have fun and happy fishing! Have you ever tried ice fishing? Tell us about what makes your ideal ice fishing boot in the comment section below.